CNG: The Coin Shop. CELTIC, Northeast Gaul. The Suessiones. 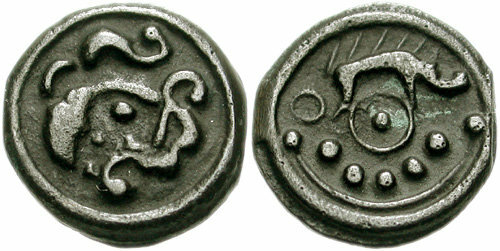 Circa 60-25 BC. Potin 18mm (3.27 gm, 8h). CELTIC, Northeast Gaul. The Suessiones. Circa 60-25 BC. Potin 18mm (3.27 gm, 8h). Head right with curling locks of hair around face / Wild boar right above pellet-in-ring; annulet to left, five pellets and pellet-headed crescent below. D&T 531A; CCCBM III 446; De la Tour 7905. EF for type, bold Celtic design with dark green, almost black patina.